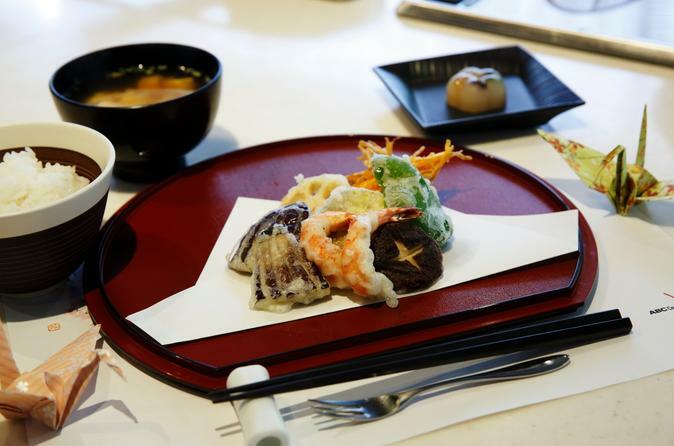 Enjoy this small group Tempura Frying class in central Tokyo. During the class, enjoy to make Tempura Gozen (set meal that comes with Tempura, Rice, Miso soup and dipping sauce) taught by a professional instructor at one of Asia’s largest culinary schools, boasting more than 150 studios throughout the region. Cooking ingredients and tools and lunch with a beverage are all included. Just bring yourself! Meet up with your instructor at 11:00 am at the reception of ABC Cooking Studio (either in Marunouchi or Nihonbashi), both located in walking distance from Tokyo station. Apron, handy towel, chef hat and beverages are all included! Following the instruction of an experienced cooking teacher, you’ll learn how to fry crispy Tempra. While frying Tempra (shrimps, vegetables, mushrooms, etc. ), also learn to cook the rice in a pot and to cook Tempura dipping sauce by using Dashi (Japanese soup stock) with many cooking tips. Finish your cooking experience at 13:00 pm by having lunch and with a sampling of 5 different Shochus (Japanese National alcohol) of various ingredients such as rice, barley, brown sugar, sweet potato and mango. Shochu is different than “Sake" as it is distilled while sake (called Nihonshu in Japan) is a brewed rice. You can enjoy Shochu not only on the rocks or straight, just like whiskey, but also with soda and juice which is called Sour Coktail.